Distributive Politics Inside the City? Do local politicians target their voters when making policy decisions? In other words, did your mayor build that park next door to please her voters? This question has been discussed by economists and political scientists for decades, and belongs to a field of enquiry we call distributive politics. Answering this question is as important as understanding the effects of the policies themselves. Why? Because policies and public investment decisions are not created in a vacuum. To state the (painfully) obvious, politicians have motivations of their own – like everyone else – and it is sometimes these motivations, and not some loosely defined “greater good”, that determine policy. Together with Luca Repetto, we have recently revisited this issue by taking a new approach and looking at the allocation of investments inside cities. Our question is straightforward: do Spanish mayors target their voters with local investment? Understanding the determinants of national policies and national investment allocations is of course important. Hence, it is not surprising that most studies in the academic literature have focused on national level allocations and their determinants. But roughly half of public investment is carried out by local governments (OECD) and we know little about how electoral factors shape those allocations. Moreover, the spatial extent and the policy levers of local governments are different from those of their national counterparts. So, government behaviour could be different too! In our paper, we try to find out whether this is the case. The main challenge when taking this question to the local level arises from a data problem. Transfers to and between local authorities are recorded in national and regional budgets, but allocations within those authorities are usually not easily accessible for research. In our paper, we overcome this problem by exploiting data from Plan E, a large stimulus program applied by Zapatero’s socialist government in Spain between late 2008 and 2011. This program transferred roughly 13 billion euros to Spanish municipalities in an attempt to kick-start the economy. Local governments had essentially full discretion to allocate investment projects within their boundaries and jumped on the resources immediately. Over 57,000 municipal investment projects where carried out under Plan E. These where usually parks, plazas, and basic service infrastructure, all of which are likely to have spatially localized benefits. And here comes the special treat. As an unusual present for future researchers, the national government required municipalities to geo-locate all projects. By combining data on these projects with polling station data for Spanish municipal and national elections, we are able to study whether Spanish mayors allocate more Plan E spending to areas of strong electoral support. An illustration of the data we use in the project can be seen in Figure 1. Notes: Points correspond to Plan E projects located in the municipality of Madrid. Census areas are coloured in red if the socialist party PSOE received the majority of votes in the 2007municipal election, with the intensity of the shade varying with the vote share. Similarly, blue areas correspond to areas where the right-wing PP obtained the majority of votes. Comparing allocations in cities ruled by different parties is tricky, because our cities are likely to be different in many dimensions. To deal with these confounding factors, we implement a close election regression discontinuity design. We compare municipalities where the socialist party (PSOE) barely won the mayoralty with municipalities where it barely lost. We then look at whether areas within these municipalities where PSOE had strong electoral support receive more resources under a socialist mayor. The main results are illustrated in Figure 2. 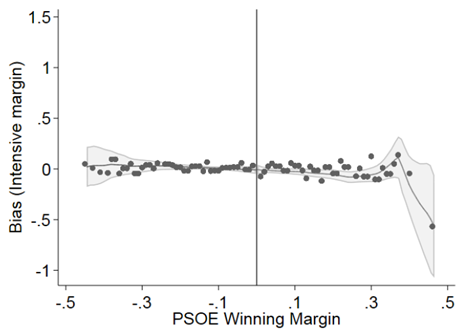 The horizontal axis represents the vote share distance to a PSOE majority. The vertical axis represents one of our measures of PSOE partisan alignment in the allocation of Plan E projects. You can think of it as the city level covariance between PSOE support and the amount of spending. The graph indicates that there is no difference in this measure on either side of the discontinuity. 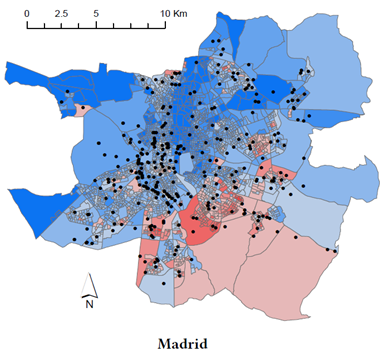 We interpret this as evidence that there is no partisan bias in the allocation of resources to Spanish municipalities. Whichever use mayors do of this money, they do not use it to invest in neighbourhoods where their voters live. Note: The vertical axis shows different measures of bias in the allocation of Plan E projects towards PSOE voters. The horizontal axis shows the PSOE winning margin, defined as the vote share distance to a seat majority change. Dots are averages in 1% bins of the winning margin. The lines are local linear regression estimates. It is tempting to extrapolate from this result and conclude that distributive politics do not play an important role within cities. Perhaps investments benefit a broader group of voters, as people moving beyond their residence and its surroundings enjoy the benefits of municipal investments throughout the city. Or maybe local politicians lack the sophistication of their national counterparts. But we must be cautious. The targeting of supporters is not the only prediction in theories of distributive politics. There is a decades-long debate between political scientists on whether politicians target their supporters or, rather, target swing voters; voters who are likely to switch sides if policy is favourable to them. If the latter theory were correct, then distributive politics could still play an important role, albeit one that is invisible to us. To be sure, we will need more research in this area. Despite these caveats, we continue to think our findings are good news. While there seems to be a good deal of partisan bias in allocation of national resources to cities, our results show this phenomenon appears to be absent within these cities. The optimism of the will may lead us to think that politicians could be targeting citizen based on their needs and not on their party affiliation. And perhaps that is good. Alternatively, the pessimism of the intellect may us to think that the game is being played in some other margin. We can’t say for sure, but we’ll try to revisit this issue in the future. I’ll keep you posted. We discuss these and other possibilities in the last version of our working paper. In general, evidence for these alternative mechanisms is not very convincing.